Is this the key to unlocking your Volca sample's full potential? Following Korg's decision to release the appropriate software development kit, we predicted that there would soon be third-party software enabling you to get your own samples into the Volca sample, and so it's come to pass. Developed by Single Cell Software, Caustic Editor for Volca Sample is a free application that enables you to "import, load, record, edit and upload samples for use with your Volca sample". The software can handle any uncompressed mono or stereo WAV file of any sampling rate or bit depth, and there are processing options and effects, too. 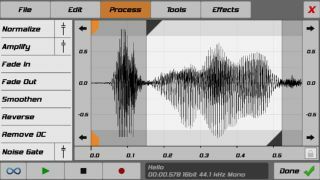 Caustic Editor for Volca sample is available for Mac, PC and Android (an iOS version is coming soon). Find out more on the Single Cell Software website.